Today, January the 2nd, we show you roosts that have been installed recently in the Water Lily Pools Zone. 1월2일 오늘은 수련못존에 새로 설치한 새둥지를 소개드리겠습니다. Wooden roosts that we installed here previously have been nibbled and torn useless by conures, so bamboo canes were used this time. 지금까지 나무로 만든 새둥지는 앵무새가 주둥이로 물어뜯어 얼마 지나지 못해 다시 바꾸지 않으면 안되였습니다.그래서 이번에는 든든한 대나무로 만들어 보았습니다. 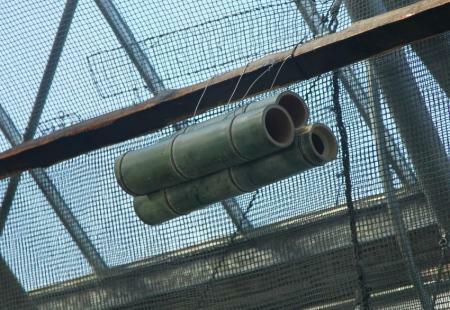 Two types of roosts are installed;first, a single cane of bamboo with holes at its both ends. Can it be a kind of solitary house? 두가지 종류의 둥지를 만들었는데 첫번째것은 양쪽이 다 뚫린 심플한 대나무한토막으로 만든 중이입니다.간단하지만 훌륭한 둥지로는 되였는지요? Next is a kind of apartment house, three canes tied into a bunch. 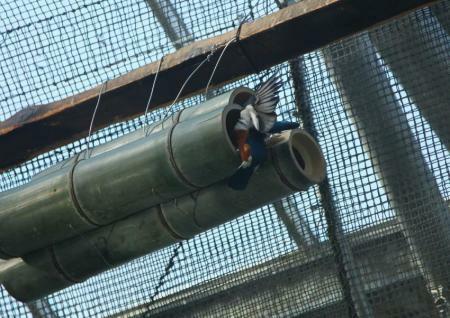 These kinds of roost will be installed more in number, a staff member said. 또 하나는 참대 세토막을 한데 묶에 만든 집체숙사같은 둥지입니다. 어느 타입으로 할지는 아직 결정하지 않았는데 이후에도 여러장소에 둥지수량을 늘일 예정입니다. As I waited for a bird to come based on an information that Superb Starlings and Sun Conures visit the roost often, I saw a Superb Starling coming to the roost. 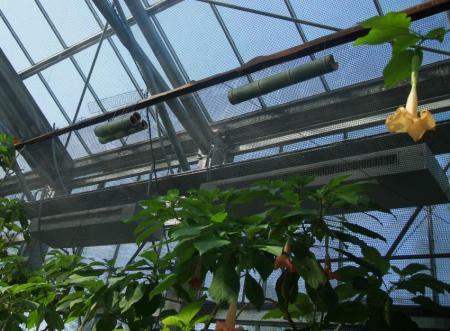 The starling started building nest in the "solitary-house" roost, a staff member said. 찌르레기와 쇠황금멕시코잉꼬가 오기를 가만히 기다려 보았습니다.과연 한참이 지나자 찌르레기 한마리가 날아왔습니다. 스탭의 말에 의하면 한토막 참대로 만들어진 새집에 이미 찌르레기가 둥지를 만들기 시작했다고 합니다. Some moments after the starling left, a Sun Conure came. 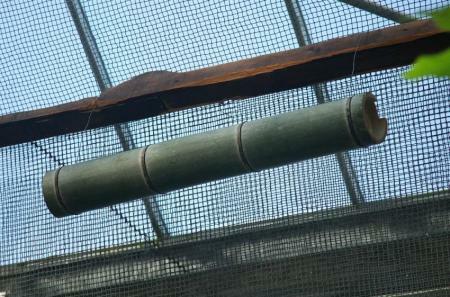 As usual it started nibbling, but the bamboo roost is too tough for the conure to destroy. 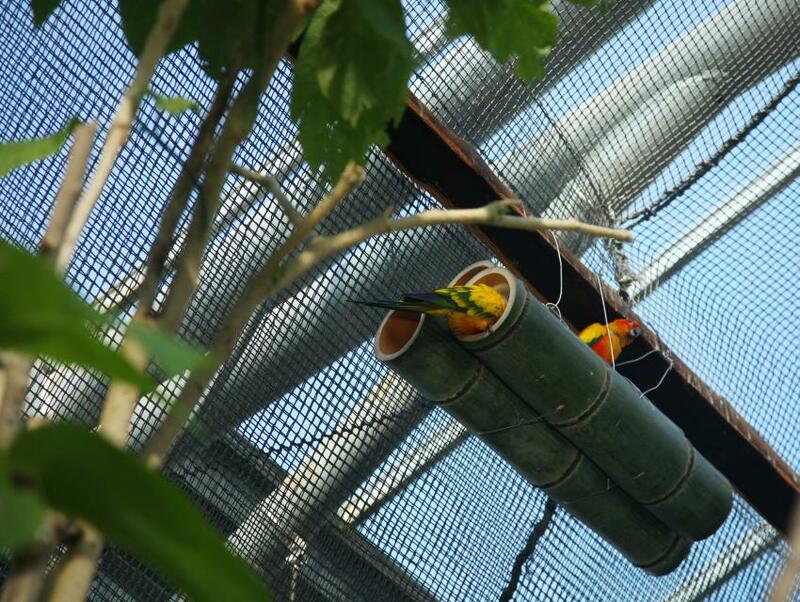 The conures are likely to give up destroying the roost and use it as a roost. Hopefully that results in some nestlings and an increase of propagation rate of conures. 찌르레기가 날아가고 이번에는 쇠황금멕시코잉꼬가 날아왔습니다.예전과 같이 쇠황금멕시코잉꼬가 집을 물어뜯기 시작했습니다.하지만 한참을 서둘렀지만 든든한 대나무는 끄떡도 하지 않았습니다.이정도라면 이제 잉꼬도 물어뜯기를 포기하고 집으로 사용하겠네요.그러면 번식률도 높아지는거겠죠?하루빨리 아기잉꼬가 태여났으면 좋겠습니다.